screen. The Lost Weekend is truly a chef d'oeuvre of motion-picture art." Winner of the Grand Prix at the first ever Cannes Film Festival, as well as Oscars for Best Picture, Director, Actor, and Screenplay, this brutal noir provided one of cinema's first in-depth studies of addiction. 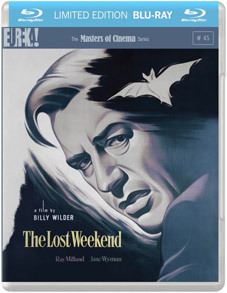 Crackling with rapier dialogue, vivid performances, and Wilder's superlative direction, The Lost Weekend gets a UK Blu-ray release – it's first time on Blu-ray anywhere in the world – from Masters of Cinema in a standard edition & limited edition SteelBook on 25th June 2012. PLUS: A 36-page booklet featuring rare archival imagery, and more! The standard Blu-ray edition will retail at £20.42, while the Sreelbook edition will be £30.63.